My sister fell in love with horses when she was a pre-teen. My daughter, pictured above inherited some of the same sensibilities. We used to have a riding stable near the cottage where we spent our summers. “Wellings” had a small paddock and one of the rites of summer was heading down horseback ride, being led around a small ring and getting a picture taken. For me at 6 or 7 years old, it was a pleasant diversion, for my sister it was the discovery of something much deeper. Without going into too much detail, my sister went on to develop a deep and lifelong love of horses. 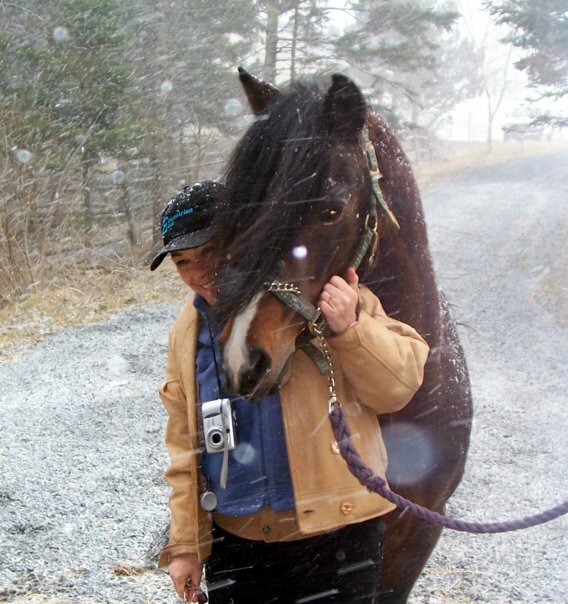 As exemplified by her photos included in this blog, she developed a keen understanding and spiritual connection with all things equine. It’s not Equus but a case certainly can be made that her intuitive understanding of horses is unique, to say the least. 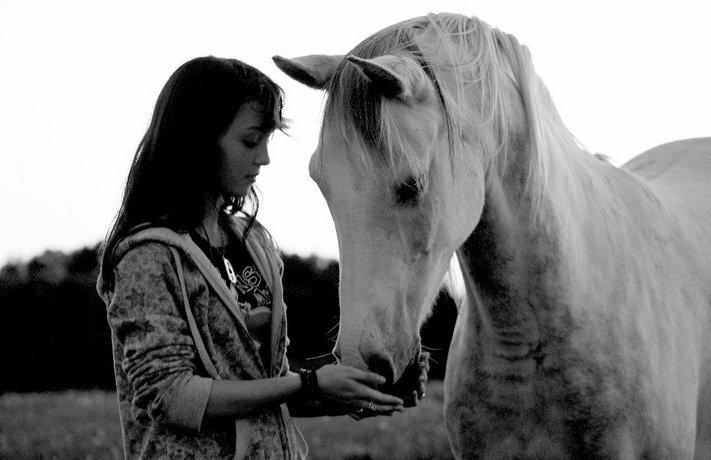 She’s pretty connected to most animals, but horses hold a very special place in her heart and soul. It’s not hard to understand why she is very upset over Canada’s policy toward horse slaughter. And she’s not alone. A small army of people who love horses have been working diligently to draw attention to an extremely unpleasant, covert and possibly illegal practice taking place throughout the country. It’s an industry that is growing and may in fact leave Canada in the unenviable position of being one of the few nations in the world promoting horses for human consumption. As our trade relationship with China and the EU grows, one only needs to look at the consumption rates for horse meat in some of these countries to see this economic “opportunity”. In 2005 China consumed over 420,000 metric tonnes of horse meat, Italy 54,000 tonnes. That ain’t chopped liver. In 2013, the European Union was drawn into a scandal involving the use of horse meat in the food supply. Horse meat is sold in several European countries in specialty shops but te scandal emerged as undeclared horse meat DNA was turning up in beef burgers, canned meat, pasta, meatballs and other processed foods being sold by major grocery retailers and fast food outlets. Some levels were as high as 29%. Horse meat is not harmful for human consumption, but the evidence pointed to some pretty unsettling conditions in the supply chain and raised important questions about the origin of the meat itself. Canada is an exporter of horse meat, and there are serious questions about whether the meat is fit for human consumption and if Canada is stepping into some pretty ethically dark corners. Canada’s horse meat industry has been under scrutiny by groups fighting horse slaughter for some very good reasons. There are few purpose bred horse meat operations in Canada. (Although, it’s growing and I’ll deal with that a little further down the page.) Most of the horse meat produced in this country originates in the leisure, racing or show horse worlds. Ever wonder what happens to that beautiful mare your daughter loved so much growing up? Eventually when these pleasure horses get past their best-before date, they are sold to suppliers who are more than happy to transport them to an abattoir to be bolted, bled and hung until they are packed for export, or crated and shipped on the hoof for slaughter in other countries. And this isn’t for pet food. US and Canadian horse meat is a lucrative business. In some cases matching prices for veal. While many cultures see horse meat as a taboo, there is growing acceptance in “foodie” culture about the use of horse meat. 83% of respondents to a survey in the UK were supportive of Gordon Ramsay serving horse meat in his restaurants. In the USA however, there has been strong opposition to horse slaughter for a several years. That has meant many horses were shipped to slaughter facilities in Canada for disposition. Condition for shipment have been lax and the Canadian Food Inspection Agency has done a universally lousy job of ensuring conditions at slaughter facilities were humane or for that matter even clean. Here’s an interview I did with Vickery Eckhoff from Forbes magazine about this issue in January 2012 on Maritime Morning. It’s easy to explain away the contempt for this practice as the protestation of horse anthropomorphism or Pollyanna-ish sentimentalism. It’s true not all horses are National Velvet, but when it comes to a matter of public food policy there is a need for the federal government and its agencies to be transparent about food production and clear about the policies it is promoting. Last week Agriculture Minister Gerry Ritz announced today an investment of nearly half a million dollars in Equine Canada to help develop key export markets with what they referred to as the long-term potential for the sale of Canadian-bred horses and horse genetics. They referred to “Their use for sport and leisure, tourism, breeding, food production and related industries.” If Equine Canada is now subsidized by the feds to promote selling Canadian horse meat in the EU, the government has a responsibility to tell all those folks showing up for the Atlantic Winter Fair where that nice bay hunter-jumper stallion is going after his retirement. Without getting into the arguments about selling phenylbutazone laced horse meat to unsuspecting clients overseas, Canada should also look at the practice of selling purpose bred food horses too. Because of the recent US decisions on restrictions on horse slaughter and its impact on exporting leisure, racing and other horses to Canada for slaughter, we can assume domestic purpose-bred operations will ramp up. Recently the Canadian Horse Defense Coalition has complained about the practice of selling purpose bred draft hoses to Japan to be sliced up for sakuraniku, a sashimi style dish of lean, raw horse meat. It’s not so much the slaughter question here, it’s the transport of these animals in far less than humane conditions. I’m not particularly squeamish about eating meat. As an apex predator I realize that if I want to eat meat, some other creature has to die. What I do want to know is that as a country, we are doing everything in our power to make sure animals destined for our dinner table are handled humanely en route to their fate. I won’t eat horse meat for the same reason I have no desire to eat dogs, cats or primates. Hear, hear. We should all climb on this band wagon. We could write a petition to our MP and get everyone to sign it. Who is our MP? Oh, yes, Scott Brison, a famous horse lover. Next PostNext Ray Ivany and the Cold Hard Truth About Our Culture of… Whaaa?